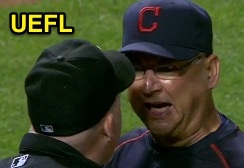 HP Umpire Ron Kulpa ejected Indians Manager Terry Francona for arguing a strike three call in the top of the 9th inning of the Indians-Orioles game. With one out and two on, Indians batter Ryan Raburn took a 2-2 fastball from Orioles pitcher TJ McFarland for a called third strike. Replays indicate the pitch was located over the inner half of home plate and knee high (px -.506, pz 1.544 [sz_bot 1.520]), the call was correct. At the time of the ejection, the Orioles were leading, 8-0. The Orioles ultimately won the contest, 8-0. This is Ron Kulpa (46)'s first ejection of 2015. Ron Kulpa now has 5 points in the UEFL Standings (1 Previous + 2 MLB + 2 Correct = 5). Crew Chief Ron Kulpa now has -6 points in Crew Division (-7 Previous + 1 Correct Call = -6). This is the 111th ejection of the 2015 MLB Regular Season. This is the 51st Manager ejection of 2015. This is the Indians' 4th ejection of 2015, 3rd in the AL Central (KC 9; CWS 5; CLE 4; DET, MIN 2). This is Terry Francona's 2nd ejection of 2015, 1st since May 13 (Mike Everitt; QOC = U [Warnings]). This is Ron Kulpa's first ejection since August 2, 2014 (Randall Delgado; QOC = U [Throwing At]).